Chalet Sundance has a beautiful dining room with an impressive dining table and seating for 12 people. By night the fire creates a warm ambience and evening meals are lively sociable occasions. Enjoy 4 courses of hearty and delicious menus with wine followed by coffee and chocolates. The chalet has a beautiful lounge with roaring log fire and a wonderful atmosphere, perfect for social aperitifs and relaxed evenings. Four large sofas provide plenty of comfortable seating. Big windows offer stunning views over the village, lake and mountains. French doors off the lounge lead onto a South facing terrace, equipped with outdoor table and chairs, to enjoy the winter sunshine. This photo is taken from just below Chalet Sundance overlooking the village of Tignes Les Brevieres and the Isere river which flows from neighbouring Val D’Isere. It is nearly identical to the view enjoyed from the South-facing windows and balconies of Chalet Le Sundance. On the left you can see the slopes heading into the village – a choice of a blue, two reds or the infamous ‘Sache’ black… if you can handle it! Tastefully furnished, bedside tables, overhead lighting, adjustable wall lighting, balcony doors open onto the lower floor balcony with mountain views, built in wardrobe with shelving. Towel radiator, large mirror, wood vanity unit, soft bath sheets and hand towels provided. Tastefully furnished, bedside tables, overhead lighting, adjustable wall lighting, large windows with stunning mountain views, built in wardrobe with shelving..
Tastefully furnished, bedside tables, overhead lighting, adjustable wall lighting, large windows with stunning mountain views, built in wardrobe with shelving. Tastefully furnished, bedside tables, built in wardrobe with shelving, overhead lighting, adjustable wall lighting, triple aspect windows with mountain views. Tastefully furnished, bedside tables, built in wardrobes with shelving, overhead lighting, adjustable wall lighting, South facing window with mountain views. Chalet Sundance is a beautiful chalet in Tignes Les Brevieres at 1550m. It has a great location with stunning mountain views. Sleeps 12 guests, 5 bedrooms, 5 ensuite bath/shower rooms, 125 metres to lift, 275 metres to resort centre, delicious four course evening meals with wine, log fire, free WIFI internet, heated ski boot warmers, UK TV, 12 stay for price of 11. Please enter the number of people in your group. If your group number is undecided please enter details in the 'other information' box below. Chalet Sundance is situated in Tignes Les Brevieres at an altitude of 1550 metres. Tignes Les Brevieres is a high altitude resort and has an excellent snow record. Thanks to it’s altitude and the aspect of it’s slopes, it has always been possible to ski from and back to the village all winter (from mid December to the last week of April) for all of the 13 years we have been in Tignes. Tignes Les Brevieres is well linked with all the other Tignes resorts, and neighbouring Val D’Isère. Chalet Sundance has a great location 125 metres from a short bubble lift on a monorail which takes you to the main lifts and slopes at the foot of the beginner slope (Pitots), a blue slope (Myrtilles), a red slope (Pavot) and a black slope (the infamous Sache). 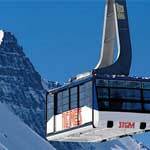 A brand new, fast 8 person bubble lift (Brevieres Telecabine, new for 2018/19) whisks you to the Boisses Telecabine in Tignes 1800 linking with two chairlifts, both giving access to Tignes Le Lac via a blue slope (Rhododendron then Petit Col) or a red slope (Bluets). The new Brevieres Telecabine connects Tignes Les Brevieres with Tignes Les Boisses and it’s beginner slope. At the end of the day you can take the short bubble lift on a monorail from the main lift station to within 125 metres of Chalet Sundance. Chalet Sundance has a secure ski/snowboard store with heated ski boot warmers which is located enroute from the chalet to the lift. Guests simply leave Chalet Sundance in normal footwear, stop off enroute to the lift to put on your ski boots and collect your skis or snowboards, then continue to the lift. Reverse the instructions on the way home to the chalet after skiing. Tignes Les Brevieres is linked to other Tignes villages during the day by a brand new gondola (Brevieres) then a free resort shuttle bus from Tignes 1800, meaning non skiers can get around independently. Chalet Sundance is 300 metres from the centre of Tignes Les Brevieres where you will find cafes, bars, restaurants, a supermarket, bakery, newsagents, post office, cash machine, tourist office, ski school and ski and snowboard shops. We have 3 free covered car parking spaces 50 metres from the chalet (height restrictions apply). Prices for our 2019/2020 Tignes catered chalet holidays are now available on the booking and availability page of our website.